During the mid 80s, the military genre was very popular in movies and television shows. On the tube, B.A. Barackus, Hannibal, and Faceman blew stuff up every week in The A-Team. In theaters, Stallone was Rambo in First Blood Part II, Arnie was simply a Commando, and Chuck Norris (before attaining internet omnipotence) headlined Delta Force. 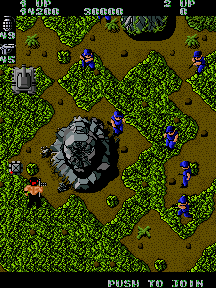 Video games, too, followed this trend, and the military themed Ikari Warriors was one example, featuring two player co-op. You may be wondering what "Ikari" means. According to Wikipedia, it's Japanese for "anger". As you'd expect, the game features a couple warriors who appear to have anger issues, and they decide to take out their aggressions on the poor unfortunate enemies who oppose them. Foot soldiers, tanks, and even helicopters are barring the way for our short-tempered heroes, known as Ralf and Clark. To say that Ralf and Clark are well armed is an understatement. Both semi and fully automatic machine guns were available, as were grenade launchers and even super grenades, all incredibly efficient at blowing stuff up. The action took place from an overhead perspective, and scrolled vertically. As the angry duo destroyed the bad guys, various power ups were dropped, but even these goodies don't reduce their anger one bit. Two player co-op was one of the best features of the game. 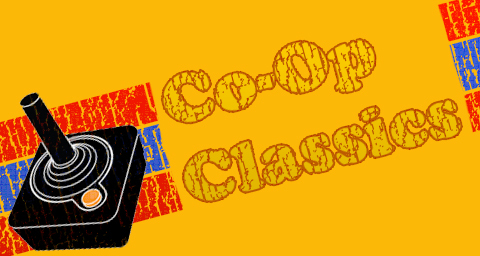 At the time, co-op wasn't very common, though it wasn't unheard of. 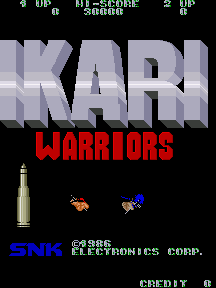 Ikari Warriors was a good time when played solo, but of course, playing with a buddy made it just that much better (and easier). With two players, the playtime per quarter was a bit longer, meaning you might have enough leftover for some popcorn or a soda. Or better yet, more games. Page created in 1.5618 seconds.